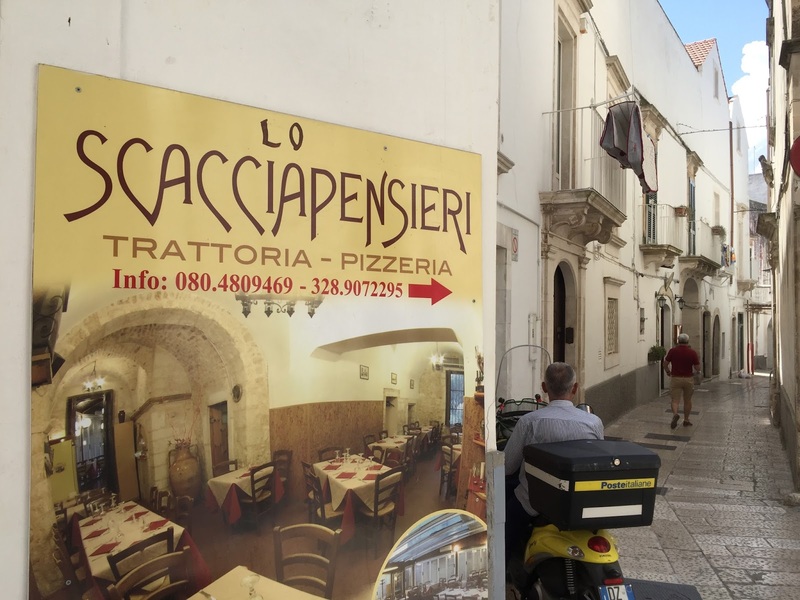 For this episode of street sign language lessons, we head to Puglia (Apulia in English, but I think it sounds bad so I avoid it). 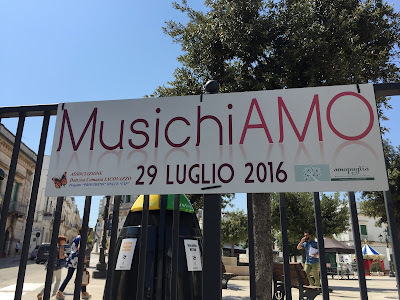 We were in Puglia for 10 days and couldn’t help but snap shots a few street signs and other words on the street that give a peak into Pugliese culture and our time there. 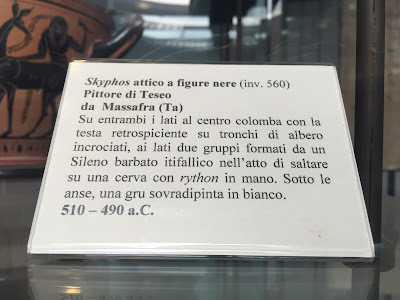 Images showing the creation of "iamo" verbs in Italian. Back in Street Sign Language Lesson V, we talked about creating first person plural verbs (“we”) out of a word that typically isn’t used as a verb. 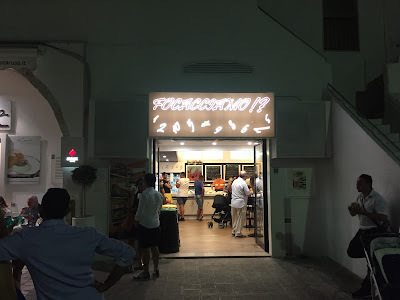 In Lesson V, it was snackiamo (“let’s snack”) and turistiamo (“let’s be tourists”). 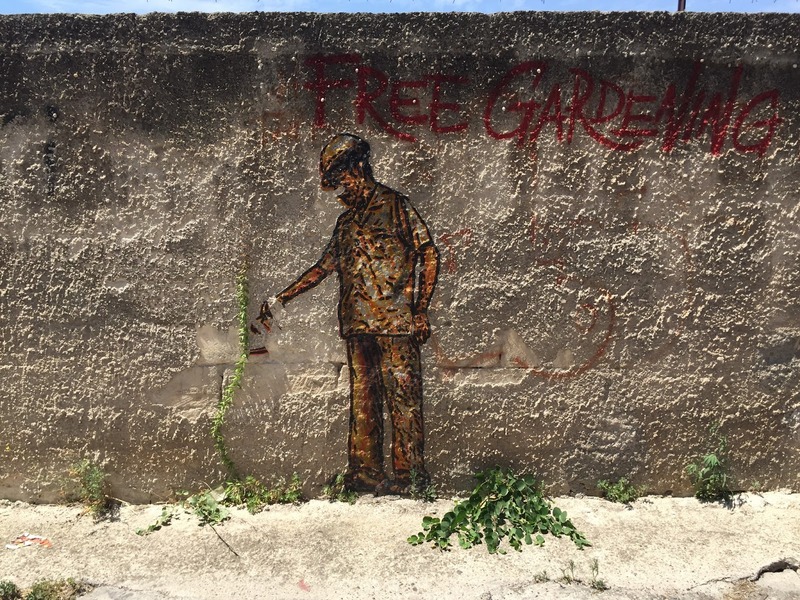 While in Puglia we captured a few more. I guess it’s just too darn cute to resist doing. 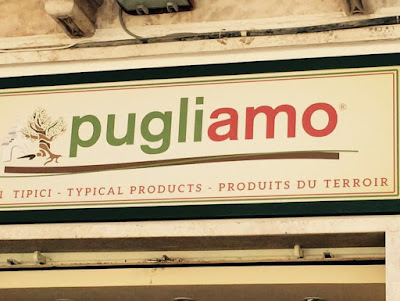 Perhaps most clever is pugliamo, which you could think of as coming from “Puglia + amo” -> “I love Puglia” and "Let's do Puglia". 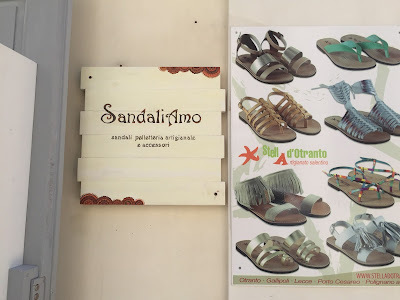 Focacciamo and sandaliamo were seen in Polignano a Mare; musichiamo in Locorotondo. 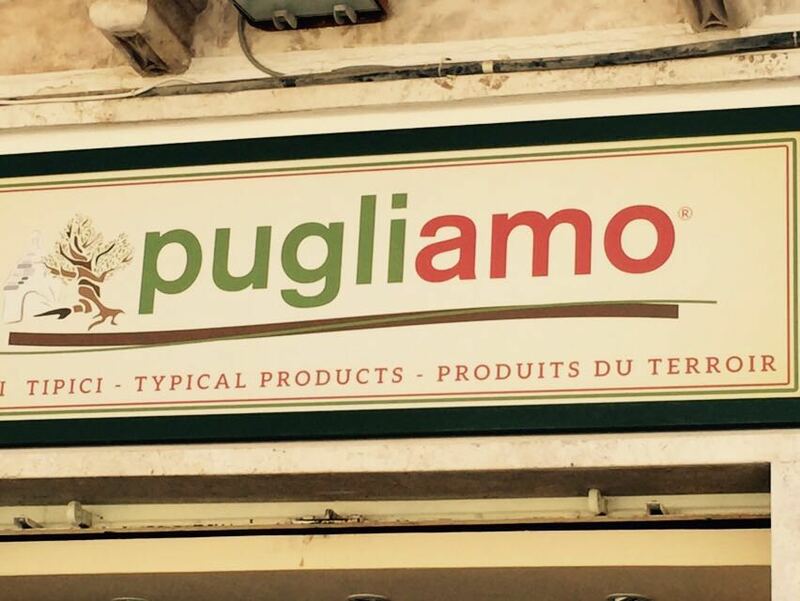 Pugliamo was sent to us by a friend who saw it in Ostuni. Left: Pizza dough made from hemp seed. Right: Six-petaled flower of the Knights Templar at Museo Faggiano. 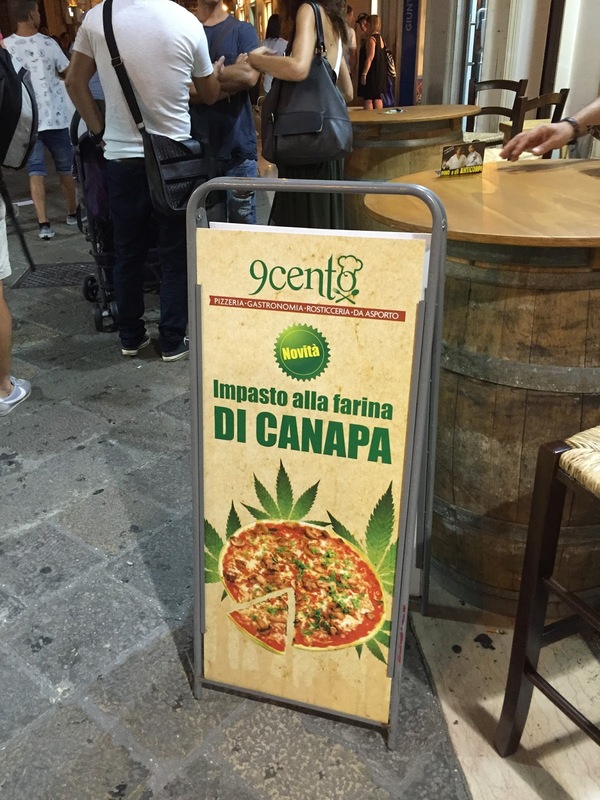 We saw this sign in Lecce promoting pizza made with hemp dough, but didn’t stop to try it. I’ve been confused for a while trying to distinguish between the iconography of the hemp leaf, Lega Nord, and the fiore della vita. Lega Nord’s symbol derives from the fiore della vita and has 6 leaves, arranged uniformly in a circle. The fiore della vita was also a symbol used by the Knights Templar. 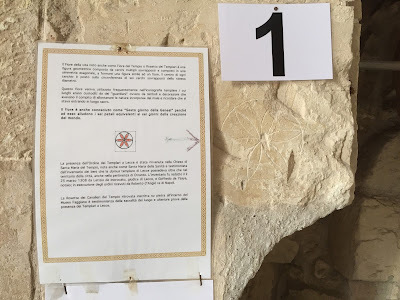 We saw this use of the fiore in the quirky Museo Faggiano in Lecce. The fiore della vita is formed by six overlapping circles. The hemp leaf is palmately compound or digitate with 3-9 leaflets of various sizes. 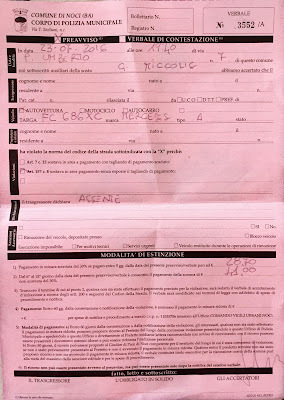 Market opportunity: impasto alla farina delle fiore della vita. Lido La Barchetta, Castellaneta Marina Italy. When we visited Puglia for the first time in fall 2010 (see Alberobello, Grotte di Castellana, Torre Gauceto), the coast (Torre Guaceto), it was deserted. Zilch, zero for people. 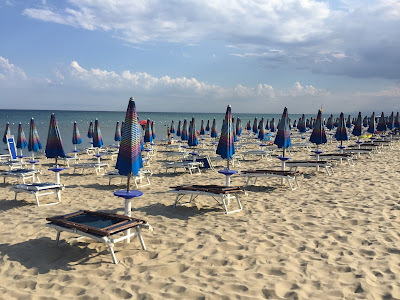 This time, on our second visit to Puglia it being peak beach season, we were in for a different experience: lots more people. Over 10 days, we swam four times in the Adriatic and twice in the Ionian. 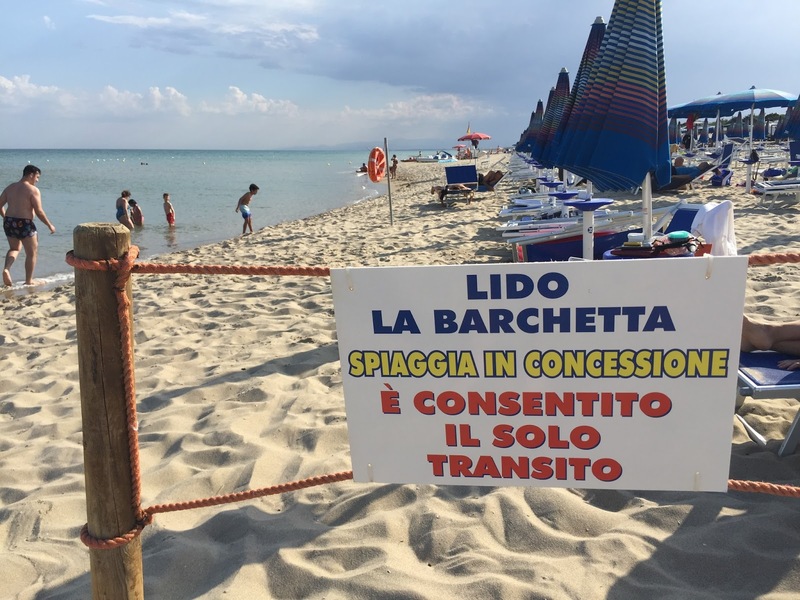 Lido La Barchetta in Castellaneta Marina, west of Taranto (pictured here) was our first lido experience. 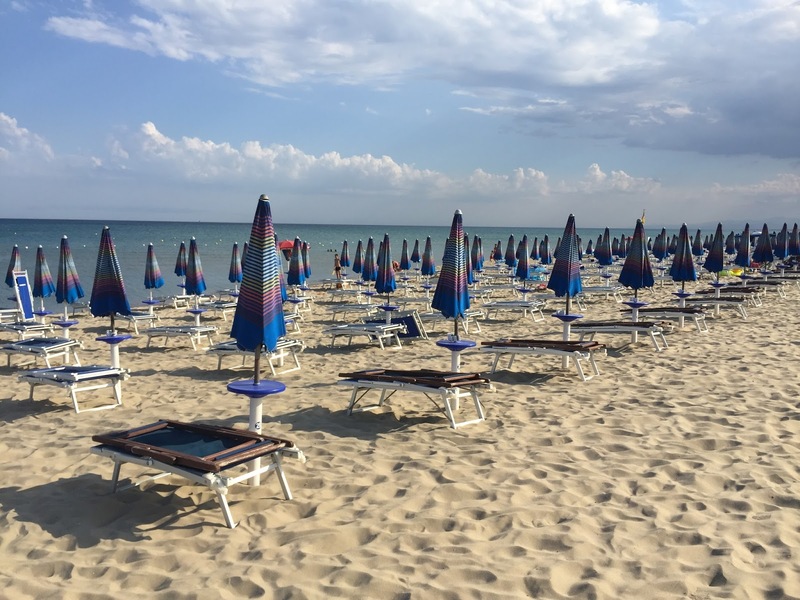 You pay to buy a position (umbrella, chair/recliner, WiFi access, music, entertainment) on the beach. On this day, we paid 5 euros a spot. This beach in the photos above looks empty because we went late in the afternoon after everyone had left for the day, and it was a weekday. 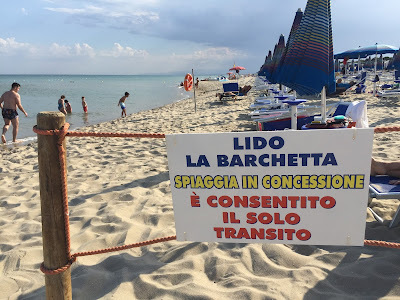 We prefer public locations (non-lido) that are in located in more interesting places such as rocky shores or little bays or coves (cale), such as Torre Incina or Torre Uluzzo, locations we went swimming at as well. 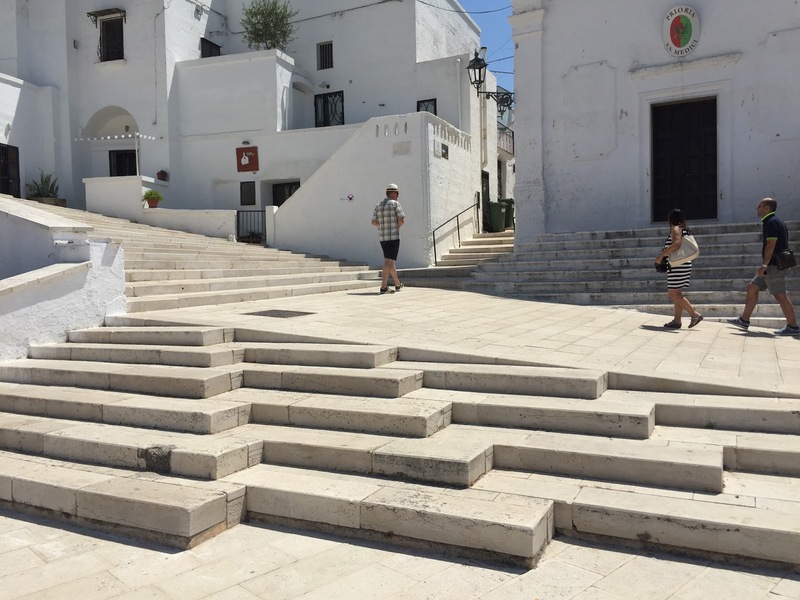 Left Two Images: Piazza in Massafra, Italy where you won't find Pokémon. Right Two Images: Street art in Massafra. 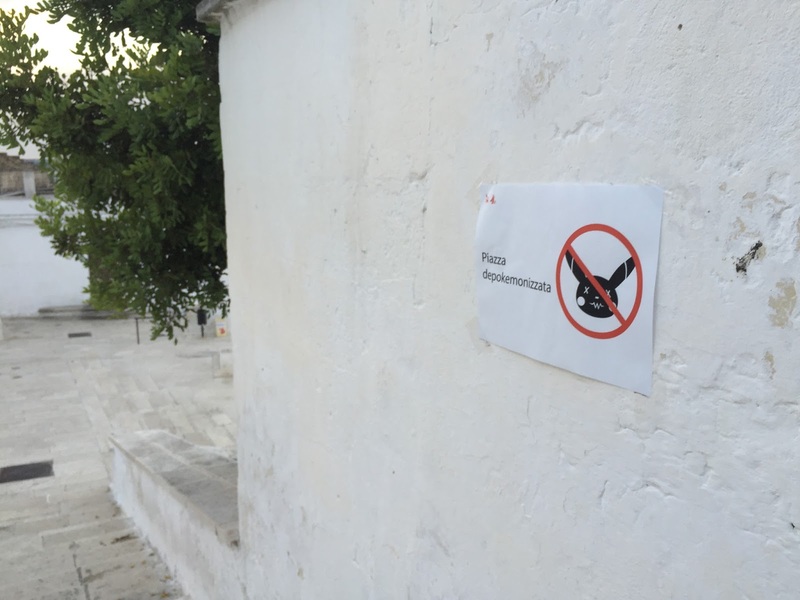 We saw the depokemonizzata sign in Massafra, a curious town we spent part of a day visiting. 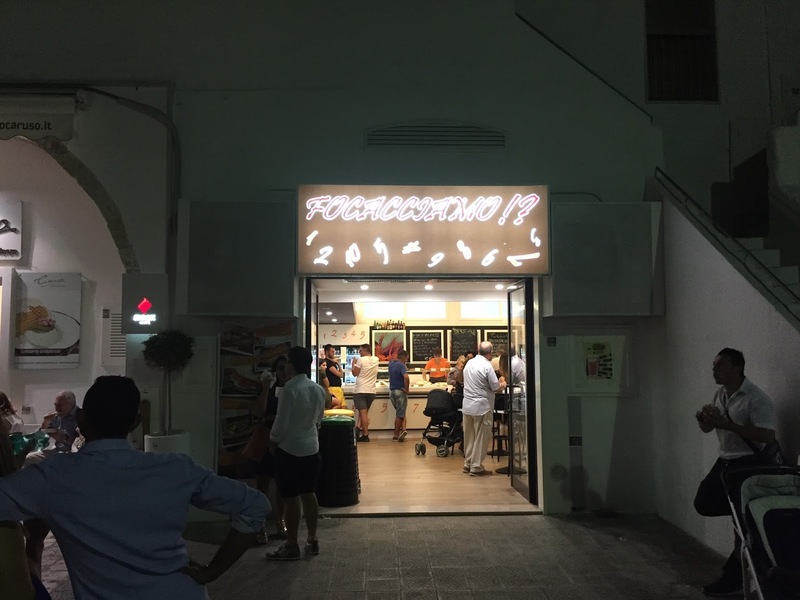 The piazza was near Falsopepe, a nice restaurant where we enjoyed a beautiful dinner on their rooftop terrace. Clearly, not everyone is embracing the latest Pokémon rage sweeping the world. I admit, it took me several moments to decode the sign as I didn't expect to find this cultural reference here. 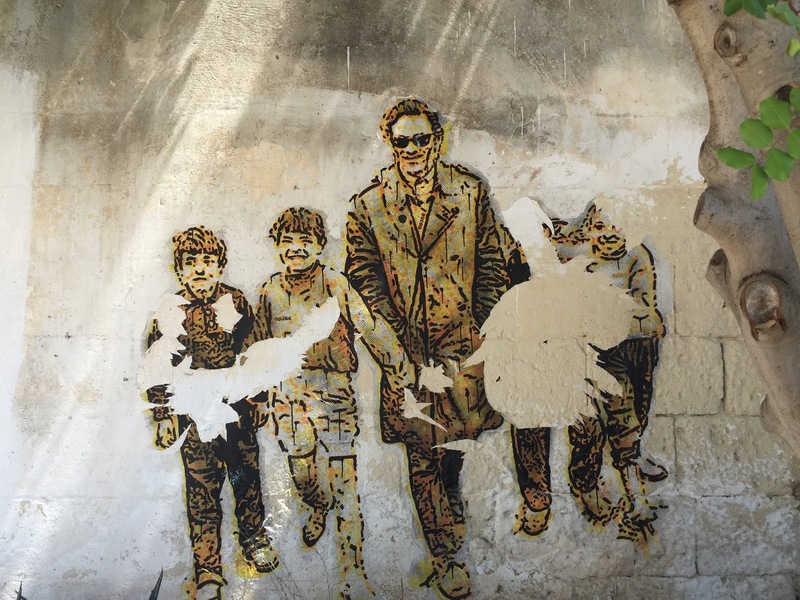 Nearby the piazza, there was some interesting street art. Massa-where you are wondering? It’s here. Scacciapensieri is a mouth harp, but it can also mean a pastime or diversion. It’s in the latter sense that I translate the name of this trattoria in Martina Franca. 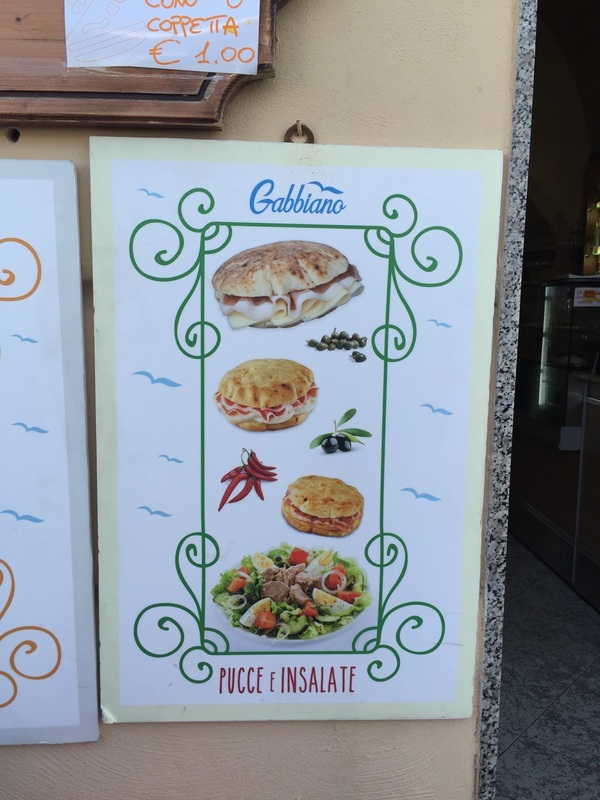 Scaccia comes from scacciare, drive away or shoo. Pensieri are thoughts. A pastime helps drive away thoughts. Maybe playing the mouth harp does the same thing? If you see someone with this written on their jacket, check that your car is parked correctly. 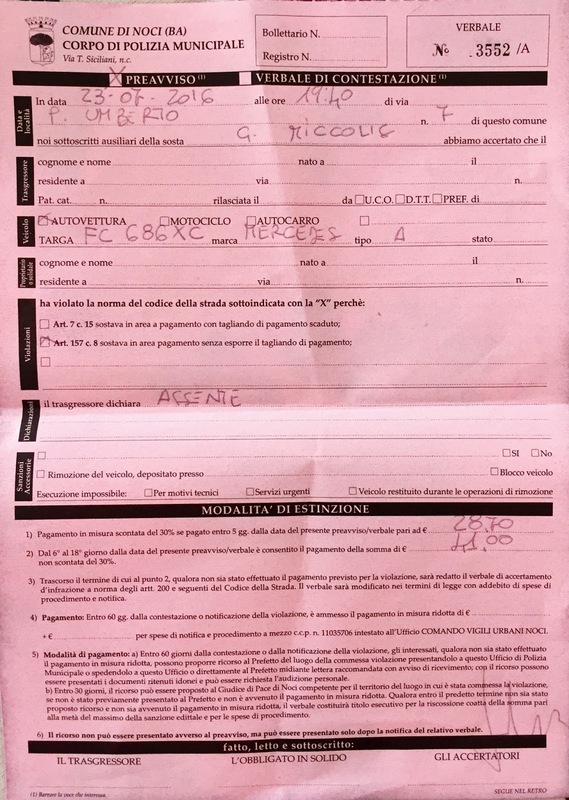 This parking ticket issued to us in Noci (BA), reads – by piecing together the phrases – noi sottoscritti ausiliari della sosta G. Miccolis abbiamo accertato che il autovettura sostava in area pagamento senza esporre il tagliando di pagamento. In other words, we didn’t pay to park and we should have. That’s bad enough, but I swear there was a bit of collusion between a group of old men who watched us park and the rapid enforcement by Officer Miccolis. There were plenty of illegally parked cars nearby, most without payment, but the officer zeroed in on us with the help of one particular old man who gleefully stood by smiling as the officer finished writing the ticket and handed it to me just as I returned to the car. We paid the fine within a day (at the lower rate) in the Post Office. 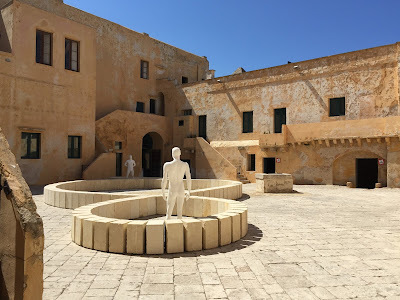 Images from the Museo Provinciale Sigismondo Castromediano in Lecce Italy. 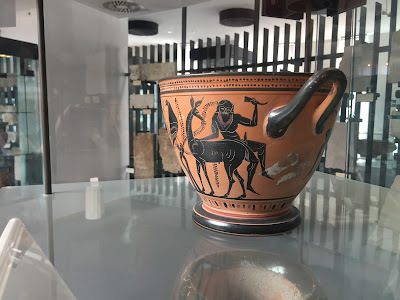 Left Two Images: A 5th century BC vase depicting Silenus. Center Right Image: Looking down on the Salento peninsula. Far Right Image: Endless display cases of artifacts. In Lecce, the museum Museo Provinciale Sigismondo Castromediano (a mouthful) is a stop for you if you are interested in the history of the province from prehistoric, through Messapian culture and up to Roman times. 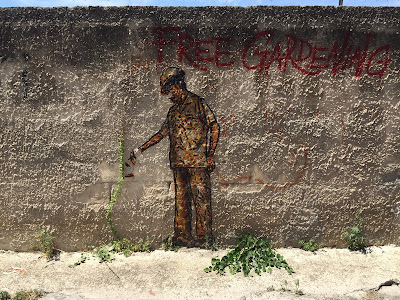 It's free to enter and is just outside the city wall to the south, an easy walk. 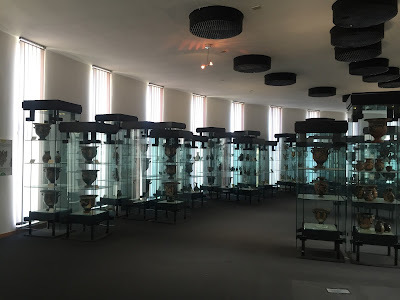 This museum is a counterpoint to the Museo Faggiano. An interesting word from the description of this vase, created around 500 BC, is itifallico, which means a phallus (il fallo) in an erect state. Castello di Gallipoli. Left and Center: Warning signs to visitors. 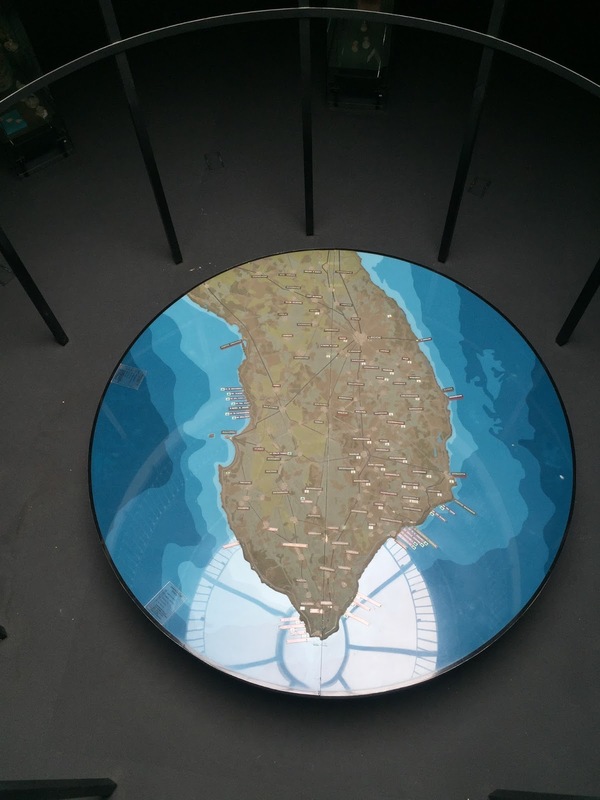 Right: Part of exhibition - Il Terzo Paradiso by Michelangelo Pistoletto. We saw these two signs at the Castello di Gallipoli. (Yeah, I know, I should be looking at the castle, not at the signs.) 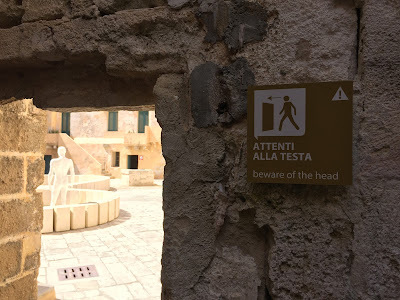 One sign translates attenti alla testa to the ominuous “beware of the head”, whereas "watch your head" is closer to what it means. 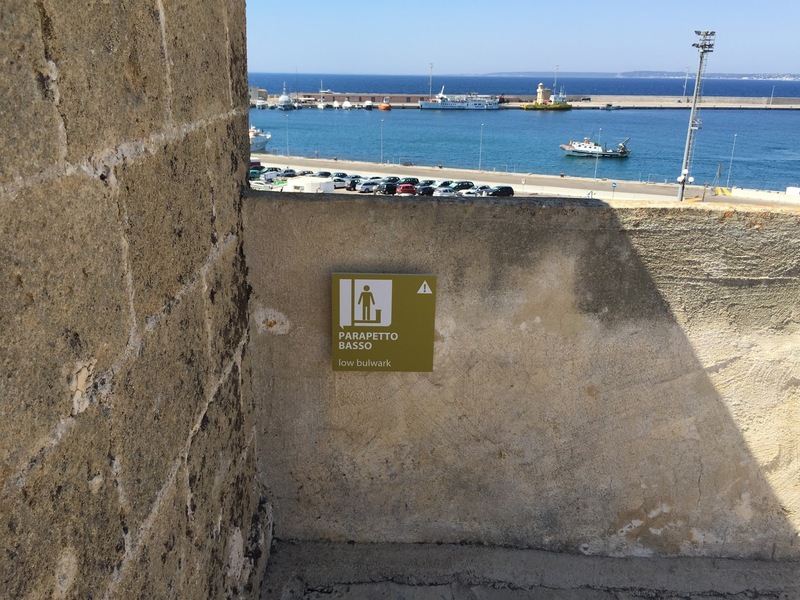 Parapetto does have one sense as “bulwark”, but most English speakers in the castle seeing the sign will experience this as a wall without quibbling as to the exact type of wall. 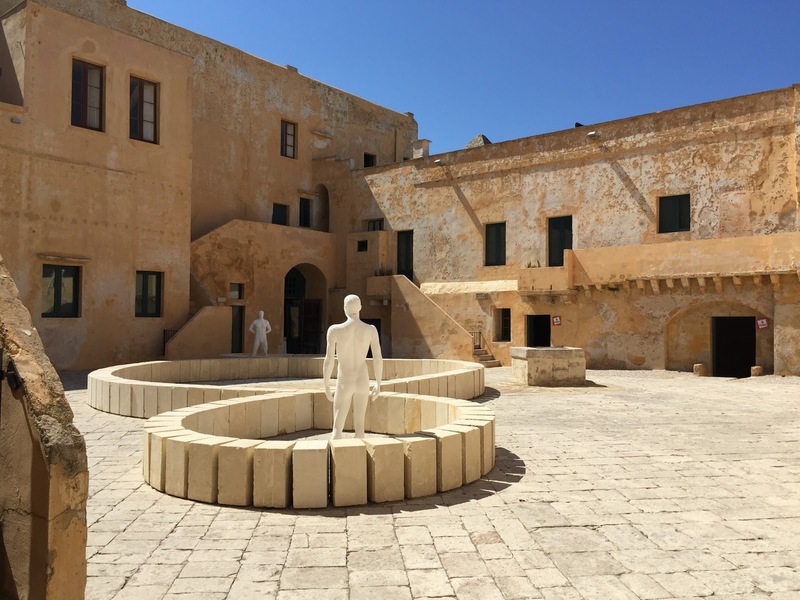 WThe castle was hosting an interesting exhibition Heroes – Eroi tra Arte e Design. 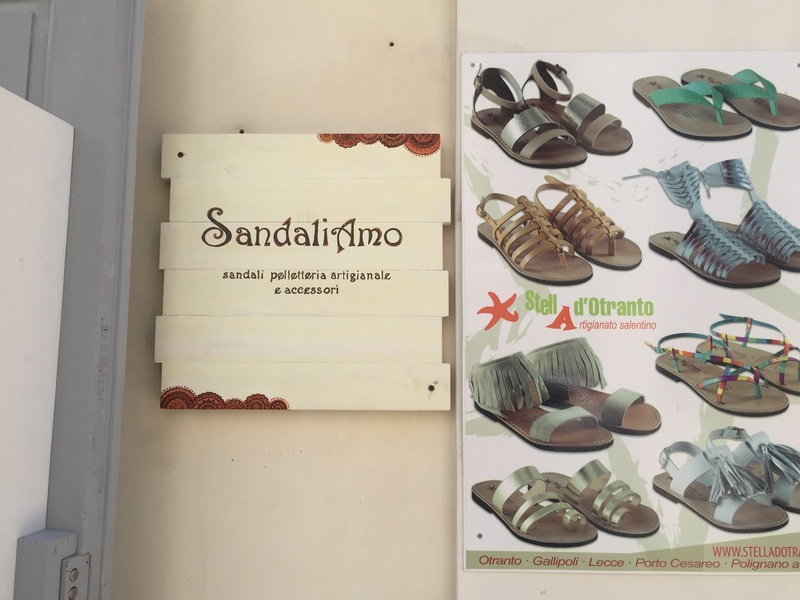 Left: Pizzi in a store window in Lecce. Right: Advertisement for pucce. 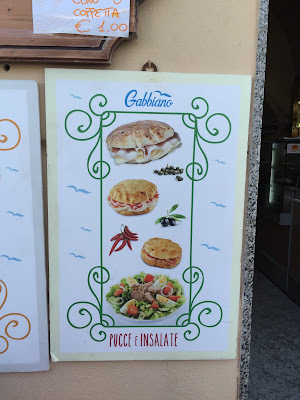 Pucce e insalate - Typical Pugliese bread and salad. Pizzi (singular pizzo) are a traditional bread you see on the streets or in bread baskets in restaurants. Be careful, the olives still have their pits in them. 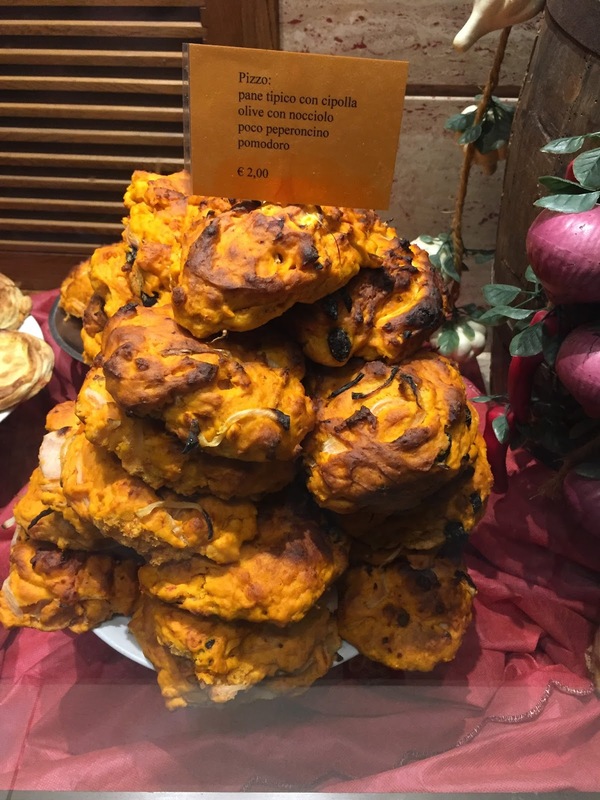 Pucce (singular puccia) are made from the same dough as pizza, and as shown in the image above, are typically used as a sandwich. Another common bread we saw in Salento (southern Puglia) were friselle (singular frisella), which are twice-cooked, hard and dry, and require a brief soak in water to eat them unless you want to break a tooth on first bite. Friselle can be conserved for a long time, and are excellent with olive oil, fresh tomato and basil.